Little Man, Little Man is the only children’s book by acclaimed writer James Baldwin. Published in 1976 by Dial Press, the book quickly went out of print. Now, at a time when Baldwin is more popular than ever, and readers, librarians, and booksellers are clamoring for more diverse children’s books, Duke University Press is proud to bring the book back into print. It will be available in August 2018. In the book, four-year-old TJ spends his days on his lively Harlem block playing with his best friends WT and Blinky and running errands for neighbors. As he comes of age as a “Little Man” with big dreams, TJ faces a world of grown-up adventures and realities. Little Man, Little Man celebrates and explores the challenges and joys of black childhood. In it we not only see life in 1970s Harlem from a black child’s perspective; we gain a fuller appreciation of the genius of one of America’s greatest writers. In their brief introduction to the book, Baldwin scholars Nicholas Boggs and Jennifer DeVere Brody explain that the illustrations and text invite readers to “look again and experience the social ills represented in the book—violence, economic disparity, alcoholism and drug abuse, and the distortions of mass media—from the perspective of a black child, and one, it is important to note in closing, who is not innocent.” They suggest that audiences at the time were not ready for this perspective, which might explain the book’s initial reception. 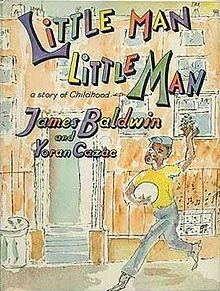 Duke University Press’s new edition of Little Man, Little Man retains the charming original illustrations by French artist Yoran Cazac and includes a foreword by Baldwin’s nephew Tejan “TJ” Karefa-Smart (the inspiration for the title character) and an afterword by his niece Aisha Karefa-Smart. Tell us what do you think about Little Man, Little Man: A Story of Childhood.